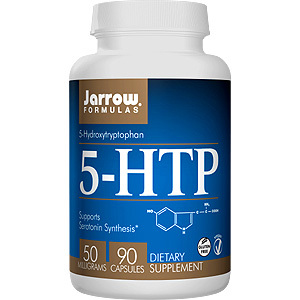 Jarrow formulas® 5-HTP (5-Hydroxytryptophan) is an extract of Griffonia simplicifolia seeds from coastal West Africa and is verified to be free of “peak X” contaminant. Purity is assured by HPLC. 5-HTP is the direct metabolic precursor of serotonin and is important for the production of melatonin. Take 1 capsule per day on an empty stomach, or as directed by your qualified health consultant. Do not exceed recommended amount. NOTE: Do not take if pregnant, lactating, trying to conceive, under age 18, or have a medical condition. If taking perscribed medication(s), e.g. antidepressant SSRIs, MAO inhibitors or sedatives, consult health professional before taking 5-HTP. Other Ingredients: White rice flour, magnesium stearate and silicon dioxide. Capsule consists of gelatin. This has definitely helped me out a lot with my anxiety. It has definitely helped me relax and no longer feel anxious. 5 HTP - is shipped in a discrete, unmarked package. Orders are processed immediately and usually take about 3 to 5 working days to be received. We do ask that you try it for 2 to 3 weeks to feel the full effects. Any information received is used only for order processing and shipping purposes. Your information, such as e-mail address, will never be disclosed to a third party.